I’m not going to lie, sometimes when I hear the words “Growth Mindset” I feel like dancing on the spot. There’s a reason for this. It’s not simply because I may or may not be a teaching nerd who gets thrills from discovering ways to help kids be engaged in learning (and let’s be honest, reduce the hair pulling that can also take place on a daily basis). It’s because when I’ve seen growth mindsets kick in with kids (and adults) the increase in their problem solving, positive risk-taking, confidence, resilience and engagement with learning has been incredible. And the thing is, it all came down to a slight shift in what I would say to them and what they thought was possible in themselves. Now, “Growth mindset” almost seems to be the silver bullet in education right now. The only tricky thing with silver bullets is that you need to know how to use them…and then actually use them correctly. It’s okay Chris, we’re here to help. Now, the purpose of this post isn’t to simply talk about the wonderfulness of a growth mindset. It’s aim is to pass on one simple anecdote I was shown that really can help kick start a growth mindset in your kids, students, partner or self. This spiel story has been used with my 5/6 class, extension maths groups, junior school students, university students, parents, school leaders, strangers on the tram and my teaching colleagues…and every time it has made an impact. Now, I don’t know if you have heard of this this amazing thing called the brain, but it helps us do some pretty incredible things… like, breathing, talking, thinking to ourselves, solving problems, remembering places and even knowing how to go to the toilet (works like a charm for younger kids…or adults). Every single day your brain is busy making connections as you learn things. Inside that amazing head of yours, connections and messages are firing and shooting around. It’s happening right now as I’m speaking and you are trying to follow what I’m saying. Back when you were in Prep/Foundation/Kindergarten (depending on what state or country you are in) you were working incredibly hard discovering and solving world changing things, like, what 1 + 1 actually equals or how to write your name. Every single time you tried to do this, your brain discovered ways to solve this and created really quick paths to send the messages. The more you did, the quicker the messages were sent. Now the messages happen so quickly it’s like you don’t even need to think and you can just do it. What’s even better is that scientists have recently discovered something more amazing. People who make mistakes – and learn from them – create more brain connections. Through making mistakes you become brainier. Today, if you take the time to work out what you do wrong and learn from it, you will actually walk out of here brainier…all because you were willing to make a mistake. Now, I don’t know about you, but I make a huge amount of mistakes every day, which means there is a huge amount of brain connections waiting to be made. The secret is to make sure we look forward to making the mistakes, after all they are the way secret to getting smarter and giving yourself an upgrade. I don’t know about you, but I’m ready to get into making some mistakes and learning from them. Nicely done, you’ve officially planted a seed to grow that mindset! Keep reiterating that focus on investing in mistakes, learning from and using them to increase that braininess…the more you do this, the more it becomes a part of your kids’ beliefs, attitudes and mindset. Please, share your experiences! 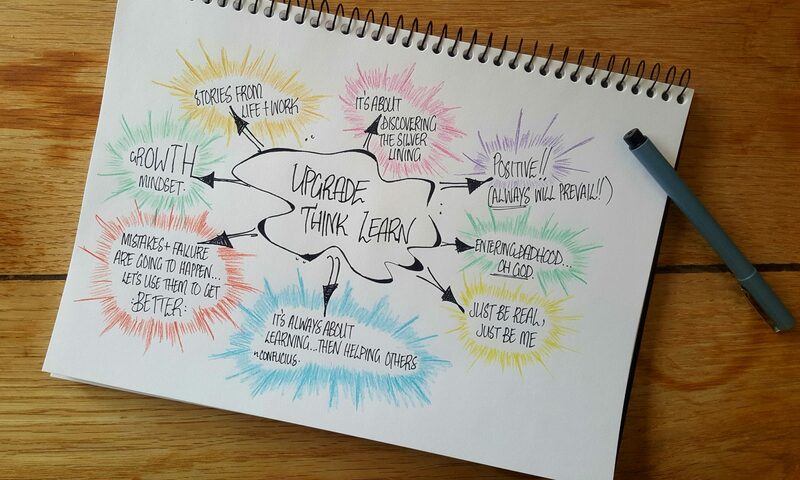 Let us know what happened and what you’ve noticed since kick starting that growth mindset! The best way to learn is from making mistakes…what have you discovered today? Our Upgraded Community Needs You! Enjoyed our newest post? We’d just like to point out that we think you’d probably enjoy our upcoming posts too…we promise giggles and possible thought provoking discussions that will get you thinking!